KARACHI: Pakistan Peoples Party chairman Bilawal Bhutto-Zardari has said that the reconstruction of Karachi is a gigantic task and the Sindh government is successfully working on it to make it once again the city of lights, peace, employment and investment. Mr Bhutto-Zardari told journalists after unveiling a plaque to inaugurate the newly rebuilt Tariq Road and remodeled Baloch Colony flyover that the Sindh government had launched a Rs10 billion Karachi package to give a facelift to important roads, flyovers, underpasses and water and sewerage schemes, which were scheduled to be completed by June so that another Rs10 billion package could be announced for the people of Karachi. “I have already issued instructions to Chief Minister Syed Murad Ali Shah for the purpose. We are committed to restoring Karachi as city of lights, peace, employment and investment,” he said. He lauded the chief minister and his team for completing the schemes within stipulated time frame. 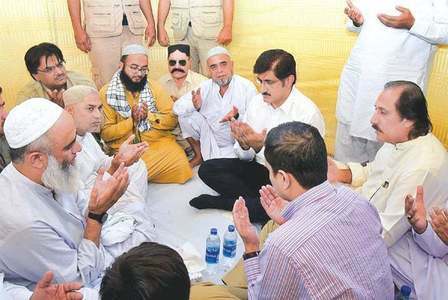 “I am thankful to the Sindh government team and also appreciate the traders community of Tariq Road who cooperated and extended support in the execution of the scheme,” he said. When he was asked about the standard of work, the PPP chairman brought forward the president of Tariq Road Association Mr Bashir to answer the question. Mr Bashir was all praise for the standard of work and said that he had never seen such quality work on Tariq Road or in the entire city during the past 30 years. “When the reconstruction of Tariq Road was in progress I used to be there even till late in the night and other traders and shopkeepers also witnessed the quality of work being carried out here,” he said. “The ongoing development work is bound to change the face of the city. 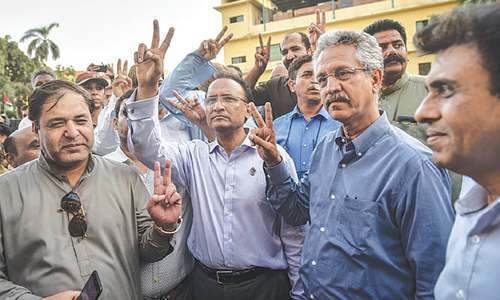 PPP chairman, chief minister and Minister for Local Government Jam Khan Shoro deserve a word of praise for doing such a wonderful job,” he said. The reconstruction work of Tariq Road up till Shahrah-i- Qauideen was launched at an estimated cost of Rs569.820 million. Under the scheme, proper drainage system and a storm-water drain have also been laid alongside the road and footpaths have been reconstructed. Later, Mr Bhutto-Zardari accompanied by the chief minister went to Sharea Faisal where he inaugurated the remodeled flyover of Baloch Colony, which had been completed within four months at a cost of Rs119.568 million. Up and down ramps of the bridge have been demolished and a 1.4-km-long service road has been built in its place. Mr Bhutto appreciated the chief minister saying “well done, Shah sahib! You are laborious and hardworking,” he said and urged him to get all the works completed within stipulated period. First put your house, Interior Sindh, in order Mr.Bilawal, then talk about Karachi. Bilawals party was in power for 5 years what did they do. They increased corruption all over Pakistan. They brought Pakistan to its knees. Karachi is suffering because of the corruption of PPP.